This is a transcript of an episode of the Amateur Traveler focusing on traveling to the Yucatan peninsula of Mexico. Chris: I’d like to welcome back to the show Zora O’Neill, who has come to talk to us about the Yucatan, in Mexico. Zora, welcome back to the show. Zora: Thanks so much, happy to be here. Chris: I say welcome back to the show because Zora talked to us before about New Mexico, and has just written, or just published, I guess is true – you probably wrote some time ago – ‘The Rough Guide to the Yucatan’. Zora: Yes. There’s a time lapse in travel guide writing – this was actually the second edition of ‘The Rough Guide to the Yucatan’ that just came out, so, I’m co-author on it, actually, with John Fisher, and he and I worked on the first edition about three years ago, and had a chance to really spruce it up again this time around. Chris: Now, as a travel writer, when you are doing something like this, are you writing a guide because you get the opportunity to, and then, therefore, you go and learn the location, or was this a location you were already in love with? Zora: Well, it’s funny. It’s been so long, I’ve been working on the Yucatan – I’ve been visiting the Yucatan for travel guide work for about five years, so it’s sort of hard to remember when I wasn’t familiar with the place. My original assignment from ‘Rough Guides’ was to update the Yucatan chapter of their Mexico book, and, at that point, I didn’t really know all that much about the place. I’d fantasized about taking a big car trip around the Yucatan and I had some contacts there, and they said “That’s great! Go!”, So that first trip was really a crash course, but now I’ve been going down there at least once a year, sometimes two and three times a year, ever since then. Chris: Now, with Mexico driving, combining the words ‘car trip’ and ‘crash course’ sounds a little scary to me. Zora: No, not at all, it’s actually really funny. I still remember when I left for my first trip. I had booked six weeks and I was going alone. I was a little bit scared, and, once I was down there, I really had to laugh. You hear so many, sort of, horror stories about Mexico, and driving especially, and terrible conditions of the roads, and bandits and policemen who try and give you tickets for nothing, and I encountered absolutely none of that, and, actually, the roads in the Yucatan are all stellar, there are no bandits as far as I have ever encountered, or even heard of, and the policemen are exceedingly polite, and it’s actually been great. And no crashes, so none at all. Zora: Well, there is – I think there’s a nice little etiquette, actually, in, when you enter a village, everybody switches off their main headlights and just leaves on their parking lights so as not to blind the passers-by, which I find very polite, but it does require more vigilance from drivers, and, of course, assuming the other drivers have been careful to leave their parking lights on. So, yeah, but driving after dark may be not the greatest idea because, also, another, sort of, common hazard on the road in the Yucatan, is people riding bicycles. Often you’re on very, very narrow roads, and, usually, people go out hunting at dusk, and so you’ll encounter these bicycles, sort of, loaded down with all kinds of stuff, and guys with guns, and maybe they have a little animal draped over the back and stuff, so, it’s better to be wherever you want to be before the sun sets, just so you don’t overlap too much with random hunters and things like that. Chris: So, if someone was going to come down to Yucatan – I say come down, ‘cause, clearly, I’m up in the U.S. – and they had only, say, a week or two weeks, they didn’t have six weeks to drive all around, what kind of an itinerary would you recommend? Zora: Well, you can see a lot, often people get a little bit beguiled by the coast, and – I mean, the Caribbean coast there is beautiful, like legendarily gorgeous, and it is really easy just to waste away a week lying on the beach! Not that it’s a waste at all, I mean, it’s a lovely place to be, but, if you’re diligent, you can drive inland. Most people I’d say drive inland, because most people come in through Cancun, that’s where most of the flights are, and where you’re likely to get the best airfare deals. The biggest city on the Yucatan Peninsula, which is Merida, also gets a few flights from the United States, mostly via Houston and some from Miami, so you can fly in there if you want to, sort of, go straight to the, sort of, inland, colonial vibe, and that can be convenient, but the airfares usually aren’t so cheap. But the convenient thing is that the drive between Cancun and Merida is only about four hours, so you’re not talking about a tremendous amount of ground to cover and you can make a nice – it’s pretty easy to loop just by driving inland to Cancun. Chichen Itza is there, about two hours in, and then it’s another two hours to Merida, and there’s a beautiful colonial city on the gulf coast, called Campeche, which you can loop down to and then just do a little meandering drive back south-west. There’s a whole bunch of ruins south of Merida that are great to visit, and then you can come back around to the coast, and around Tulum, say and come back up to Cancun, and you could do that pretty easily in a week, if you were not too lazy and easily distracted, like I can be! It’s nicer to give yourself ten days because the Yucatan is a very, very mellow place. That’s contagious, and, once you get there, you can easily spend an afternoon doing nothing on a plaza, so between a week and ten days is a good amount of time, and you do get a chance to, sort of, soak up some of the more rural atmosphere there as well. Chris: And so it does sound like you are recommending to rent a car in Cancun and drive? Zora: I would say it gives you the most flexibility. It’s certainly not necessary; there’s excellent bus coverage. People will be blown away by the quality of the, sort of, deluxe, first class buses in Mexico, now beat the pants off any airline you might fly on these days. You get a very nice movie, you get your personal headphones, you get somebody giving you coffee and tea and a little snack, and the seat reclines all the way. So there’s actually a really great express bus between Cancun and Merida that’s still quite cheap, even when you go at the best class, and even when you get out in more rural areas, there’s still really excellent bus coverage, it just takes a little bit more planning, and, if you do want to visit the ruins south of Merida, that area is usually called the Ruta Puuc, because the area is called the Puuc Hills, and all the ruins there are the same style, so, if you want to do that area south of Merida, which is kind of an easy, little day trip loop. That’s usually the one place I’d recommend getting a car. So it’s often you can go between the major cities on buses and then maybe take, if you want to cut down your car times, and maybe rent a car for an overnight, and go down to the Puuc area south of Merida and do a little loop around, and that way you can go from ruin to ruin to ruin in a day, without having to wait for a bus. Chris: And how many different ruins are in that area then? Zora: Let’s see. Uxmal is the main one down there. That’s sort of the second biggest set of ruins, aside from Chichen Itza, in the Yucatan, so Uxmal is the biggy, and that’s about an hour south of Merida, and then, past that, there are four or five other little ruins, and there are some of the most intricately carved and crazily decorated. They’re kind of small in area, and buildings, but the decoration there is really exceptional, and so you can go from, sort of, there’s some really great, huge pyramids at Uxmal, to smaller buildings in the surrounding area. A lot of those are, sort of, tucked away in the greenery and so much more hidden away, so it’s, kind of, a good balance, where you see the majestic, and also the intricate detail. Chris: And I’m assuming we’re talking about Mayan ruins, all of them? Zora: Yes, sorry, I guess I should have specified! Give the basics. There’s so many pre-Columbian cultures in Mexico, empire after empire, kind of thing. It’s easy to lose track, but, yeah, the Maya Empire took over the entire Yucatan Peninsula and was also down in Guatemala as well, and Belize, and some of the biggest ruins are actually down in Guatemala and some of, I would say, the absolute coolest, coolest ruins in the Yucatan Peninsula are actually the ones that are closest to the Guatemala border, and the hardest to get to. They are way down South, in an area that hardly anybody goes to, in the middle of a biosphere reserve. They’re called Calakmul, and they’re in another area where, also, there are many surrounding small ruins, so you can make a little trip down there. But Calakmul is huge, huge, huge city, and they’ve only excavated, kind of, a tiny part of it, and you drive down for about an hour through the middle of this biosphere reserve, on a one lane road, and the one lane road is filled with, like, wild turkeys blocking the way, so it takes a while as you’re always having to stop for wildlife, and you hear the howler monkeys out in the distance, and there are crazy birds flying in front of your car, and you finally get down there, and, basically, the center of it is this tremendous one huge pyramid, and you climb up to the top of the pyramid and you see nothing but greenery to every horizon, and it’s with, sort of, no intervening sign of civilization, which is really a tremendous feeling. The Yucatan is not very heavily populated, but pretty much every half an hour or so, you’ll hit a small town, so if you’re just driving around you still feel like you’re in the middle of everything, but it’s amazing how just driving an hour off the Highway will suddenly get you into the middle of some of the densest jungle in Mexico. It’s really a great side trip. So I’d say that’s the pinnacle of the Maya stuff, but certainly the least accessible. Worth the trip, if you’re really into that, but there are many more accessible ruins up in the Northern part of the Peninsula as well. Chris: Now you mentioned the beaches, which, of course, a lot of people are going down there for. Anything we should know? I want to almost move on from the beaches but I really should pause there and say “What should we know about going to the beach in the Yucatan?”. Chris: And that sounds like it’s still less expensive then, too. A lot of people would be turned off by, well, when the power turns off. Zora: Ok. I have to admit I have a troubled relationship with the beach at Tulum. I don’t know, my budget still does not stretch to easily throwing down a $100 a night for a hotel, and then I resist throwing down $100 when I’m not getting, sort of, all the normal amenities that $100 would get you at a hotel Mexico, which is usually quite a lot, so, in a way, in Tulum, on the beach, you’re paying for simplicity, and I can totally see why this is appealing to people who are really wanting, like, to clear their brains, total beach escape kind of thing, with not aggressive parties – there are a couple of really good mellow beach party scenes at various hotels in Tulum, but it’s not an aggressive scene, really. Chris: It’s not girls going wild. Ok.
Zora: Yes, fortunately. Like, I’m not at the level where I would shell out that much for candlelight. There are a couple of places where you can easily – I will not name names – but there are some grossly overpriced hotels on a Tulum beach, so I have a little bit of trouble with it, and I wish I were at a point where I could just pay that much money and enjoy it, because it really is a beautiful setting and some of the hotels there do a fabulous job, and it would be a treat to stay there for four or five days, and, you know, just listen to the waves and not much else. So those are, sort of, the twin poles of the Riviera Maya which is, sort of, we’re initially talking about the whole beach scene. In between Cancun and Tulum there are a whole bunch of tiny towns, and there is also the town of Playa del Carmen. Zora: It’s, kind of, the capital of the Riviera Maya. 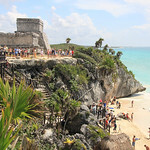 It’s bigger than Tulum, it’s more built up, it’s still pretty low rise there. There’s a city building code that nothing can be over four storeys, so you don’t have those, sort of, big towers casting a shadow on the beach the way you do in Cancun, and it’s definitely a party scene, but it’s a European party scene, it’s also like, Mexico City jetsetters go there for the weekend. Zora: So, it’s very, like, Mexican ‘hipster’ which is, kind of, cool to see. If you’re expecting authentic, really, I don’t know, authentic, indigenous Mexico, with everybody in tribal costumes, you’re not going to get that, but you’ll definitely get, like, contemporary, cool Mexican culture in Playa del Carmen, and great, great food there. Really good Mexican food, and also there are a whole bunch of Italian expats who have really good restaurants, and lots of Argentineans as well. So, Tulum, Playa del Carmen and Cancun are the big cities, and then there are, not big, but just the biggest points, and then there are lots of little tiny beach towns in between. And that’s just the area that’s called the Riviera Maya. South of Tulum is this whole other area. There’s a big biosphere reserve that takes up a whole bunch of the coast and, south of that, is an area that’s been dubbed ‘The Costa Maya’, just to keep you confused in the terminology. There’s a town called Majahual, and another tiny, tiny village called Xcalak, and those are, kind of, the ends of the earth. Xcalak is almost on the border with Belize. And Majahual was unfortunately in the press, I think it was just last year, no, two years ago – I lose track of the hurricanes in Mexico – Majahual was in the news because it was, sort of, right where hurricane Dean made landfall – I think it was last hurricane season – fortunately, the Mexican government runs incredibly smoothly when it comes to hurricane relief, and the town is, sort of, totally back to normal by all reports now, so that’s really encouraging. So, basically, you can go from, like, super developed Cancun, all the way to, like, the end of the earth, all along the Caribbean coast, and we haven’t even talked about the beach towns along the Gulf Coast. Chris: And which is your favorite? Zora: Well, I’m very, very fond of Playa del Carmen, it, kind of, for me it, kind of, hits the sweet spot between, sort of, a cool beach retreat – the beaches there are very nice – and actual stuff to do and things to eat. Majahual is developing in a very interesting way, it’s, kind of, on this accelerated development pace where, in the time I’ve been visiting, it went from, like, nothing, like not having regular electricity, not having phone lines, to suddenly having all that stuff, and then there being a cruise ship pier nearby, and people starting up businesses to cater to the cruise ship people, and suddenly they’re being, like, one hotel that looks like it should have been built in Playa del Carmen but springing up on a random, totally empty beach in Majahual. So it was a little odd in a way. I haven’t been down there since the hurricane, that was the area that my co-author updated this time around and he said it looks fine. I’m very curious to see what made it through the hurricane and, sort of, how things have changed. The pace of change down there can be a little alarming, so, something that people said is a totally remote, beach bum area one year, can change really quickly. People automatically think that means, “Oh, it’s spoiled.”, but I would say no, it’s, like, change is not necessarily a terrible thing down there. People are doing really interesting things, and change may mean just more places to eat delicious fish, so. I really don’t want to criticize at all, I’ve seen some really wonderful developments in that area, in the time I’ve been going down there. One place that I do really like, and I always wish I could spend more time, is a little place called Isla Holbox , which is actually spelt H-O-L-B-O-X, and it’s on the Gulf Coast of Mexico, which, sort of, runs all along the north edge of the Peninsula and down along the west coast. The Gulf of Mexico is not nearly as, like, picture perfect greeny-blue as the Caribbean is, it’s more sort of a cloudier, pale green, so you don’t get that, like, envious postcard scenery while you’re lying in your lounge chair, but the water is gorgeously warm, and clean, and Holbox is cool because it’s this little barrier island. It takes – oh, I never know – it takes, like, two or three hours to drive up there from Cancun, and then you have to take the ferry across, and, once you’re there, there’s, kind of, nothing to do, it’s still a sand street, tiny little village. It can’t grow that much ‘cause it all subsists on one giant generator, basically, and they can’t add too much more to the grid, so it’s pretty basic. And the thing Holbox is famous for now – and this has happened only in the last five or six years – is that, just off the coast every, like, August, September, usually, a huge group of whale sharks gather, and these are, kind of, a rare animal. They are actual sharks – this is terrible, I haven’t though about them and I’m like “Are they whales or are they sharks?”. Chris: No, I think they’re sharks. Zora: No, they’re definitely sharks. No, I’m, like, no, I was afraid of them, that means they’re sharks! But you can go paddling around the water with them and, kind of, see them up close with your scuba gear on, and they are sharks, they have that like, creepy, sharky under bite, but they are actually filter feeders and they don’t have big nasty teeth, and they are humongous and they are so calm and beautiful, and they’re black, and covered with white spots, and it’s just a really amazing experience to be able to be in the water with these animals. You’re not allowed to touch them, they really don’t like that, but that’s, sort of, the big tourist drive in Holbox. In August, September, the town suddenly gets really crowded, well, relatively crowded with people, and everybody goes out on day trips to see the whale sharks and then, the rest of the year, the other ten months of the year, there’s hardly any one there, and you, sort of, have the beach all to yourself and you can go on these long walks up and down, well, that’s what I would imagine you do, if you’re not a travel guide writer, and you don’t have to turn around the very next day and take the ferry back out and go. That always stands out as one of those pictures, like “When I have real time I’ll come back!”. Chris: Ah, the part of travel writing that we don’t really hear. Chris: So we’ve talked about the beach, and we’ve talked a little about the ruins. The third thing that you mentioned, that always gets my attention, like the ruins because I’m a history buff, is the colonial cities, and I really don’t think of the Yucatan and immediately go to colonial cities, so, I’m a little surprised always, I don’t know why. Tell us a little more about that. Zora: Well, basically, the history of the Yucatan is pretty fascinating to me. It’s developed separate from mainland Mexico, mostly because, well, geographically, it’s pretty cut off, it’s only connected to the rest of Mexico by this tiny little strip of territory, but there was not even a road connecting the Yucatan Peninsula to mainland Mexico until the late 60’s or early 70’s. The whole territory, in fact, wasn’t even an official state of Mexico until the 70’s, and the whole territory was much more oriented toward Europe and the Caribbean, culturally, than it was toward Mexico, so it has definitely Spanish colonial heritage to it which was huge, but a lot of the wealthiest people in the Yucatan oriented themselves culturally towards France, as well, so, in Merida, a lot of the grandest old buildings from, like, the late 1800’s are all very French in style, and there’s some grand avenues lined with these mansions and things that are really impressive. So you have the French overlay on top of the old Spanish colonial buildings and some of the most huge ornate churches and things like that, which you would see all over Mexico, surrounding Merida and surrounding each other, other colonial outpost in the Peninsula are the old haciendas, which were huge plantations for henequen. It’s a plant that looks like it’s a tequila plant, which is sort of a big yucca, but the fibers of it were used for rope, and, basically, the whole wealth of the Yucatan grew out of this crop, which the whole world got their rope via Merida for a while, and that, kind of, took a nosedive, once synthetic fiber came in, in the early part of the 20th century. So you have the structure of the haciendas that dictates the smaller towns surrounding the big cities like Merida and Valladolid, and each little town is built very much the same way. It can be very disorienting to drive from town to town, because you’re like “Mm, I was just here, but it’s not quite the same…”. Like there’s the Plaza and there’s the giant church and there’s usually a big ball field, and everything is painted these gorgeous, gorgeous shades in various states of decay and fading of like really rich ochre, and deep red. I know that the colors are beautiful and the architecture is very sort of stark and dramatic. The whole Yucatan is very flat so you can, kind of, look out and see these giant churches standing up against the sky, it’s quite dramatic. That stuff contrasts with the bigger places like Merida and Campeche, and there’s also a great town that I briefly mentioned, called Valladolid. The houses are all really brilliantly painted and also have one storey with various ornate, European architectural details. You have to see to believe. If you’ve travelled around central Mexico to some of those colonial towns, a lot of it will look somewhat familiar, but, sort of, the coloring and subtle details are very Yucatan. Chris: You said that this is the second edition of the guide book. What has changed in the inbetweening time? What were the noticeable changes? Zora: Oh, man. Well, the big obvious changes are all along the Caribbean coast. Chris: Ok. That’s what I wondered. Zora: In the time I’ve been going down there, Tulum has gone from being, like, a dusty town where you got off the bus and there were, like, random dogs wandering around, and you’re like “How do I get to the beach, that’s where the action is, I hear?”, gone from that to a proper town with divided little central median and sort of side lanes and topiary and a new bus station, and it’s really tremendous and I’m sure it’s changed wildly since I was there last, which was only last year. That whole beach area is, in a way, like, really hard to keep track of, and I feel very bad. I do my best as a guide book author, but these books are only updated every three years, so that’s why, actually, I did keep a website, roughguideyutacan.com, where I post a sort of blog format. I just post major changes as I hear about them, and so, if something’s closed or something has changed radically, I do put a note up there, and, hopefully, readers, when they buy the book, can go check the website and see if there’s anything that needs to be majorly changed in the guide book before they head out. One of the other things that has changed dramatically, to me, though much more subtly for visitors, is the City of Merida, and many of its colonial houses have been bought by expats and by Mexicans and redeveloped, so it’s downtown, it sort of has a beautiful fresh coat of paint, in many ways, and there are many more beautiful places to stay, and the City has developed a pretty decent art scene, as well, so, the last time I was there, there were little gallery shows and some very cool cafes to hang out. Merida, to me, has always had a great cultural scene. There are always every time I’m in town there’s some kind of great arts festival or contemporary dance or something, but there’s a much more palpable, young kids doing artistic stuff in Merida, which is great to see, so your trip isn’t always all about huge old churches and museums and things like that. Chris: Ok. As we sort of transition and start to wind this down, I know that you’re a foodie, so what should we eat when we go to Yucatan? Zora: Oh, Yucatacan food is really super delicious The first thing that’s noticeable about it is the colors of it, sort of, the way the architecture is painted, all these rich colors, the food on your plate is also brilliant colors. Yucatacan cuisine uses annatto or achiote, which is a bright red color, it’s a seed that they grind up and make into a paste, and it gives everything this bright red orange color, so you often get pork or chicken or fish cooked in achiote, and then that’s usually served with a side of picked red onions, which is this beautiful, beautiful bright pink color. Then you get the sort of deadly habanero salsa on the side, with a little red yellow hit as well. Yeah, basically people are often afraid of Mexican food being hot, and, certainly, in the Yucatan very little is innately hot and it’s up to you to put on habanero salsa to your liking, which to most people’s liking is literally like a drop. Zora: I mean, I’m not exaggerated, as we talked about the last time I was on, I’m from New Mexico, I know from hot, so I know the chili, I can take it, but even I approach habanero salsa with extreme trepidation and it can also be a little alarming to visitors, because they’ll give you, like, habanero hot sauce in a bottle, like Tabasco, but they’ll also give you a bowl of what looks like, sort of, normal pico de gallo, like, raw tomato salsa, which I think a lot of Americans think of as the mild option, and it looks totally fine but it actually has little pieces of habanero in it, and it’s really, really deadly, and the Maya word for it, that they use everywhere is Xni Pec, which actually means dog’s nose, because that’s how sweaty it makes you when you eat it! Which I love that! So, yeah, if you want to get the nose sweat going, you go for a generous dab of the Xni Pec, but, otherwise, you want to proceed with extreme caution. I haven’t gotten into specifics of what the food is. There is great, great, long stewed pork in banana leaves, which is called cochinito pibil or puerco pibil. Really rich, really soulful, super delicious. Um, when you go to the beaches, you get something called Tikin Xic, which is fish wrapped in banana leaves with the achiote paste, the red achiote paste and onions, and grilled, so you get a nice like rich smoky flavor on your fish. You get really delicious shrimp tacos, battered, deep fried shrimp, quick fried, for some reason, maybe it’s the like loving the French for so many years, people in the Yucatan are really, really into mayonnaise. Zora: It’s actually hilarious – every time I go in a supermarket, I laugh at, like, how much shelf space is taken up with mayonnaise, it’s, like, more than the salsa. It makes no sense. So the shrimp taco is usually served on a corn tortilla with a smear of mayonnaise to sort of hold your shrimp in place, then you shake on, there’s usually a mild tomato salsa for that one, so you don’t totally wreck yourself. There’s one place in Playa del Carmen, it’s on the Highway, called La Floresta, where, conveniently, I’ve always managed to make my trips very inefficient, and I have to drive through Playa del Carmen about eight times, but, every time I drive by, I’m like “Great! Time for La Floresta!” and I stop off and I have a couple shrimp tacos and a cane sugar coca cola and it totally hits the spot. Chris: Time of year to go? Zora: Typical high season is January through April, and that is when it is just completely beautiful throughout the Peninsula. It can get a little, a little bit chilly in Merida. By chilly I mean, like, upper 60s, where you might be like “We signed up for, like, a tropical vacation, but, ooh I have to put on a sweater.”, and people in Merida complain bitterly when it’s like upper 60s in January, but they’re all wearing their huge turtleneck sweaters and things. And that’s also the dry season, like, you shouldn’t encounter any rain. If you’re going to go and stay in a slightly expensive thatched roof room on the Tulum beach, definitely do it in that season. Once you get into May it starts getting noticeably hotter, it’s going to be like lower 90s and really humid and you might start getting a little rain, and the rain really kicks in regularly by, like, July. It’s not all day rain, usually, it’s usually like a really strong rain shower for about forty five minutes in the afternoon, which is not too much to disrupt your travel plans. If you’re driving, you’ll probably want to pull over ‘cause it’s often so strong that you can’t see. I was, initially, for the first time I went there, a little concerned about road conditions during the rainy season and things being washed out, but, pretty much everywhere you want to go, the roads are fine. There’s only one notoriously terrible road that you can’t do in the summer. I know from bitter experience, from Tulum, if you drive south from Tulum into the nature reserve that’s there, there’s a tiny, tiny little town at the end of this horribly – I can not exaggerate how bad! – potholed road, like, literally, like, I always rent the teeniest car, like, the thing that has now replaced the VW Bug in Mexico, for the most part, a teeny tiny car and, like, I’m driving down into potholes that I feel are big enough my whole car fits in them. I had a total disaster driving down this tiny town, it’s called Punta Allen, so if somebody says to you, in the course of your trip planning, “Oh go to Punta Allen, the middle of nowhere, a great beach getaway.”, it is, it’s a fabulous, like, nothing to do but lie on a hammock kind of town, but you basically can’t reliably get there outside of that dry season, like, January through April because the road is just too, too terrible. I once did manage to get down there in my rental car and then there was a terrible rain storm and I could not get out, I had to hitch a ride on the beer truck! Chris I don’t recommend anybody have to do for their regularly scheduled vacation, I, kind of, prefer going down to the Yucatan in November. The rainy season winds up. Some people can also call that the hurricane season. The risk of hurricanes, kind of, starts in the August and goes through October. If there’s not a hurricane, it’s like no more dramatic than your regularly scheduled rainy season afternoon rain. If there is a hurricane, you could still have a perfectly nice time and, somewhere two hours down the coast, get battered, it’s very hit or miss. Like I said, the Mexican government is, like, a well oiled machine when it comes to dealing with hurricanes, and nobody should stay away from Mexico because they’ve heard of hurricanes there. I can’t emphasize, like, they really have it down to a science. That said, I would not book your honeymoon, on the Yucatan Peninsula, on the beaches in early October, mostly because a lot of the really nice hotels know best and they just close for a month and give all their staff a break, but, once the hurricane rain sort of winds up, that, usually, things kind of start drying out by early November and, by the end of November, it’s gorgeous, gorgeous. There are hardly any tourists down there, not that there’s ever a huge crush of tourists, outside of the beach areas, but you really do have a lot of the archeological sites, like at the Maya ruins, totally to yourself in November, so it’s no problem getting a room in your favorite hotel and that kind of thing, so, fortunately, a lot of my research trips have coincided with November. Prices really spike right around Christmas holidays, but you can usually get great deals in November and December because it’s no the prime tourist season quite yet, but you have a lot of the benefits with the weather. Chris: Ok. As we wrap this up, the best day you’ve had in the Yucatan. Zora: The best day I’ve had. Ooh, it’s hard to narrow down, and now, of course, all I’m thinking of is my, like, colossal bad trip down to Punta Allen that one time. Even that like turned into a great day because there was the beer truck there, and the guy was happy to drive me. Hard to narrow down. It would have to be a day where I got to stop at La Floresta for the shrimp tacos! Although, just as I’m saying that, I’m also thinking of one time when my husband came down to visit me on one of my research trips, and he just came down for about three days while I was in the vicinity of Merida, and we just had a great time driving the little back roads in that Ruta Puuc area I was talking about, with all the little ruins. Driving around down there, and people are so gracious and polite in the Yucatan. Pretty much any encounter you have with somebody is going to be incredibly heartwarming. The thing I’m thinking about on our trip was, actually, we were driving back up and I was about to drive to the airport and drop Peter off, and realized like, “Oh, we have time for lunch, where should we stop? I don’t know.”, and we had been driving toward the airport and happened to see a little sign for, like, home cooking, basically stuck out in front of somebody’s house. And so we drove into this little residential neighborhood and we stopped and had a little lunch at this woman’s house. People are pretty enterprising, and they’ll just put out their shingle, as the home cook person, and what they’re usually doing is making meals to the people arranged to have delivered to their work places or they’ll stop by with their Tupperware and they’ll get their lunch and take it away, but this woman had a couple tables set up in her front patio, and we just had a great talk there with the one other guy who was having lunch there, and he was a doctor and just a really sweet guy and he’d spent a little bit of time in the States and just the random encounters, I mean, I’ve had so many random encounters like that which, I guess, is the essence of travelling anywhere but I really feel like the kindness and politeness of people in the Yucatan is really exceptional and the local pride and, if you can work in any Mayan words, people are very pleased. What I love about the Yucatan is the Maya presence there is huge, and, even if you are somebody who doesn’t really have any Maya lineage, you still use Maya words very commonly in your speech and take a great deal of pride in that local indigenous culture which, I haven’t travelled much in central Mexico, but I get the impression it’s much stronger that pre-Columbian culture is much stronger in the Yucatan than it is elsewhere in Mexico, and it’s a great thing to see. Chris: If you had to describe the Yucatan in three words, what three words would you use? Zora: …and later, which, in itself, is a totally remarkable thing. Like, if you’re interested in urban development and urban planning, Cancun is totally fascinating. The more you look, especially in the hotel zone, the more you’ll see that it’s as used by local Mexicans as it is by tourists, and there are so many great little, like, tiny hidden away fish places and things like that in the hotel zone, which at first glance just looks like tourist mayhem, but actually it’s a pretty surprisingly, like, integrated and mixed situation there. Anyway, so Cancun. Cancun, compared to Merida, is a little bit frenetic, and Merida is sort of the ultimate ‘tranquilo’ city, like, more than a million people live there and you would never know it, it feels like a small town, once you get down the main Plaza. I would also describe the Yucatan as romantic. There’s a beautiful, beautiful style of music that is particular to the Yucatan. The Yucatan was very influenced by Cuban music, and there’s these old romantic ballads that are just, sort of, heartbreakingly beautiful, and people singing them all the time. You can hire your own romantic crooner trio to serenade you, if you want. They’re all over the place. And it’s not like a touristy thing where they berate you in restaurants, they’re just there, ready to sing incredibly romantic music at the drop of a hat, and, sort of, in that romantic vein, you see older couples, and young couples, like, everybody is always, sort of, sitting on benches staring dreamily into each other’s eyes, so, if you are going, I always warn people who are going down there with like platonic friends, just, you know, proceed with caution! This even may get to you. ‘Tranquilo’, romantic, I would also say really rooted, like I said, the Mayan culture is still so strong there and there’s this tremendous pride in that, that really influences everything, and just gives a very good feeling to the place, and the continuity of history is really impressive, it’s really, really rich, and I feel so lucky to have been given what started out as a slightly random assignment, and feel so lucky to have been able to get to know a place so well through my research, through my guide book research, and I can’t wait to go back! I think I’m going back, probably, next March will be my next trip so I’m really looking forward to it. Chris: Our guest again has been Zora O’Neill, talking about the Yucatan and her new book ‘The Rough Guide to the Yucatan’. Zora, thank you so much for coming on the show, sharing your love of the Yucatan. Zora: Oh, my pleasure. I just hope I inspire some other people to go and enjoy it as much as I have. Chris: And I’ll have links in the show notes to Zora’s various blogs, I think you’ve got three or four as I recall from our last talk. Zora: Oh yes, yeah. Like I said, ‘Rough Guide to the Yucatan ‘ is the one. 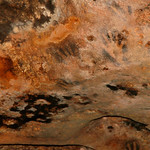 If you do buy the book, definitely go to the website roughguidetotheyucatan.com and look for, sort of, major corrections. Fortunately, there’s only one thing up there right now, since the book just came out November 3rd, but there’s always that lag between doing the research for the book. The last time I was down there was February. There’s always that lag, between researching the book and the book coming out, where something goes wrong, and I’m like “Oh, the restaurant closed, it was so good!” so there’s that, and then my personal website rovinggastronome.com but I trust, so. Chris: Zora, thanks for being on the show. Zora: Great. Thank you so much.